Is this really a good idea? 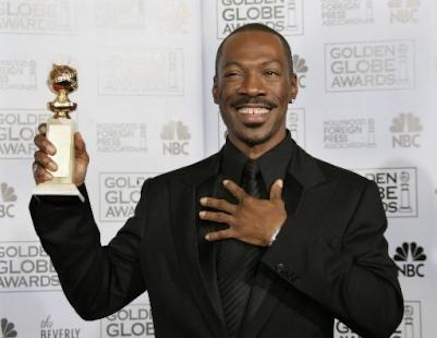 Eddie Murphy, whose big-screen bombs have outpaced his hits in recent years, has been named to host the 84th annual Academy Awards. Murphy, an Oscar nominee and Golden Globe winner for his work in 2006's Dreamgirls, represents a renewed back-to-basics approach for the Academy, which tried and failed to youthify its TV audience last year with the combo of Anne Hathaway and James Franco. She tried hard, he didn't seem to care and Oscar's TV ratings dropped significantly from the previous year (when veterans Steve Martin and Alec Baldwin hosted) in both total viewers and advertiser-coveted 18-to-49-year-olds. "Eddie is a comedic genius, one of the greatest and most influential live performers ever," Oscar co-producer Brett Ratner said in a publicity statement Tuesday. Not coincidentally, Murphy's latest feature film, Tower Heist, is directed by Ratner and scheduled for a November open. Murphy, 50, is notoriously un-fond of the press and angrily left the 2007 Oscar ceremony immediately after losing to Alan Arkin in the best supporting actor category. But in the publicity release sent by ABC, he pledged to work with Ratner and co-producer Don Mischer to put on a show that is "enjoyable for both the fans at home and for the audience at the Kodak Theatre." ABC again will televise the Oscars, which are scheduled for Feb. 26th. Murphy is the fourth Saturday Night Live "Not Ready for Prime Time" player to host the ceremony, following Chevy Chase, Billy Crystal and Chris Rock. ***Regis Philbin's last day as co-host of the syndicated Live with Regis and Kelly will be on Friday, Nov. 18th, the show announced Tuesday. Until then, get ready for the "Regis Farewell Celebration Season," as it's being dubbed.